Digby Court will be built on the grounds of the former Bishop Wilson School in Pike Drive following the school’s move to new premises in nearby Chelmund’s Cross. Developer Bellway will also fund 64 affordable rented homes for local people, invest £100,000 in an all-weather sports facility, pay for improvements at the nearby Meriden Park, create a landscaped green area within the homes and pay £178,000 towards a new drainage system. Marketing director Stephen Rose said: “North Solihull is growing in popularity due to the scale of the regeneration taking place here. “Our previous developments in the area have all proved to be big successes and have sold extremely quickly. We’re expecting Digby Court to follow suit. “This development offers something for everyone. It provides a variety of properties ranging from one-bedroom apartments to four-bedroom houses. Regeneration work in North Solihull began in 2005 and since then Bellway has built hundreds of private and affordable properties. New schools, shops, health centres and community centres have been built thanks to money raised by the sale of land from Solihull Metropolitan Borough Council to Bellway. The company has also invested money to improve the infrastructure across the area. Bellway is also currently building at Centric Mews in Smith’s Wood, where there will be one and two-bedroom apartments alongside two-bedroom houses. 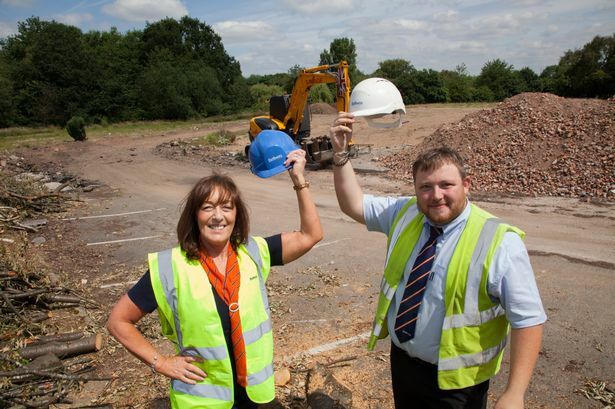 Pictured: Sales Advisor Sheila Hawkins and Site Manager Alex Lacey at Bellways new Digby Court development in North Solihull.